EU Prophecy News: How Much Power Does the EU Actually Have? Here are some interesting facts about the EU that are similar to states with national sovereignty. The UK has a whole political party devoted to leaving the EU, which is called the United Kingdom Independence Party, which wants to separate itself from the EU. Due to political sensitivities and the unprecedented nature of the EU, legal scholars have a difficult time classifying it. It is typically considered a very strong confederation that is in the slow process of becoming a federation. As a result, it is called a "supranational union" and is the only such union in the world. Is no longer just a set of treaties, but has legal personality, just like nations have. This means that it is a corporate entity and can act as one. Has the same currency in 17 states. Has an unelected body (the Commission) which has the competence to propose legislation. It is widely recognized that some national sovereignty was given away to the EU during the ratification of the Lisbon treaty in 2009. For the first time ever, it seems there are the same number (or more) of secular sources that are as paranoid as prophecy watchers about the growing power of the "European Superstate." Don't believe me, read any article in UK online newspapers about the EU, and look at all the nasty comments below it that decry the EU "superstate" and demand to leave. Fear of a "United States of Europe" is no longer limited to prophecy watchers and prophecy watchers are no longer the loudest voice in this area. The EU is in a process (which will take about a year and a half to approve) which intends to ultimately cede control of national budgets to Brussels, in order to make sure that they are fiscally responsible. People who live in one EU state can work in another without a visa. The EU makes embassies that represent itself. The EU as a legal entity has the power to form international treaties. Many decisions in EU law are no longer unanimous, but are the product of "qualified majority voting." This means that 55% of countries have to agree as long as those 55% constitute more than 65% of the EU's population. There are set procedures to secede from the EU which can take up to two years to complete if no re-negotiation is reached. The EU has troops which can deploy for brief missions (and regularly does this). They often wear the EU patch on their shirt or the EU flag is painted on the helicopters, etc. The treaty of Lisbon is widely recognized as having most of the same text as the original "European Constitution," except with opt outs and revisions tacked onto it for specific member states. Commission President Barroso has called the EU the first "non-imperial empire." Member nations retain a lot of control in areas regarding foreign policy and defense. The EU cannot decide to go to war and force all of its member states to provide troops. 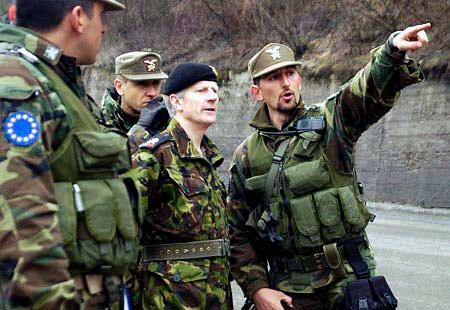 However, the Lisbon treaty does direct member states to increase their military capabilities. If the EU is attacked, all of the member states have to use all the means in their power to defend the attacked member state. This however does not prejudice any specific foreign policy stance they have. (I.e. the Swiss are neutral so they are not obligated by this part). The Western European Union, a now defunct 10-nation military alliance, reaffirmed their commitment to the principle mutual defense in light of the new Lisbon treaty. As a result, they decided to close their organization. The EU is widely known for taking a long time to get things done, because of its complex bureaucracy. It even has two presidents, one permanent president that has 2.5 year terms, another rotating president. This is why people get frustrated with them, because they are slow moving and can't respond fast enough at times. As you can see, the EU has many properties of a state, but in some ways does not. One can think of it as an extremely weak federation or a very powerful confederation. So pretty much the European Union is becoming a force to be reckoned with. Given current events, the Euro could collapse. However, they won't let it collapse, because member states are too entangled into the EU. They are in the process of making a full economic union due to talks that began on June 28, 2012 that were big in the news. And the Bible says that someone will attack the Antichrist and he will respond by attacking many countries.